Hyenas may look like dogs or large cats, but they are so unique that they have a family all their own: Hyaenidae. The mongoose and the meerkat are their closest relatives. 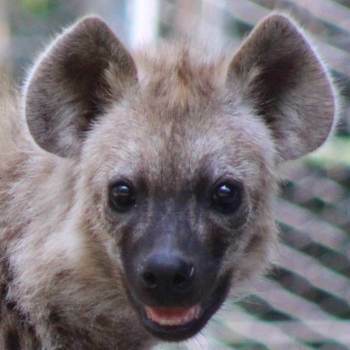 The spotted or laughing hyena is thought to be the strongest, most capable hunter of any predator of its size. 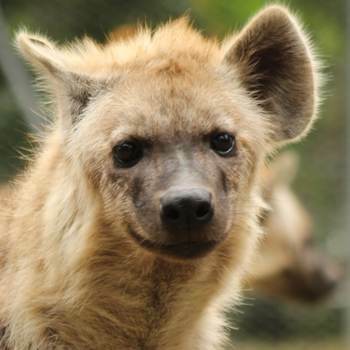 It is the largest member of the hyena family. Its famous chatter actually sounds like a human laughing hysterically. This “laugh" is used during times of nervous excitement or submission to a dominant hyena. Although they are mostly scavengers, hyenas are also skilled hunters, able to take down relatively large prey. Their large head and strong jaws are filled with huge teeth used to crush bone. Hyenas give new meaning to the phrase "lick the platter clean", as hyenas eat practically every part of the animal, including skin, hooves, bones, and teeth. The Red One in French. The Big One in Shona (native Zimbabwean language). 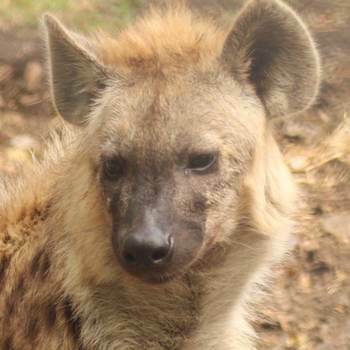 Hyena in Shona (native Zimbabwean language).